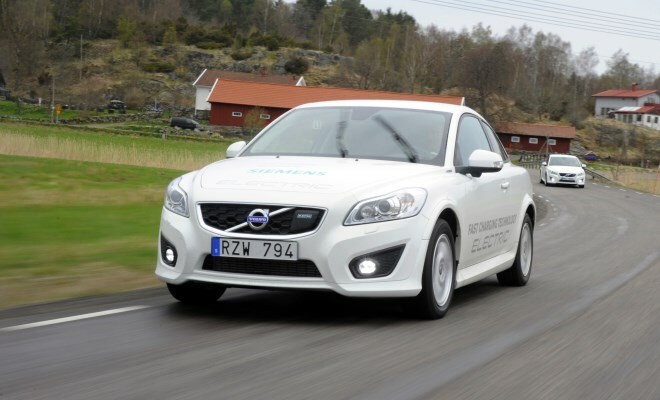 I’m back in Sweden, two years after I last drove a Volvo C30 Electric, to see how far the car has progressed in the interim. Today I’m driving one of a pair of second-generation cars, developed by the Swedes in partnership with German industrial giant Siemens. Alas, one important thing hasn’t changed a jot over the past 24 months. Volvo still has no plans to put the car on sale, and indeed the C30 model as a whole has now taken the big off-ramp to oblivion. It’s no longer in production at the company’s Belgian factory since the new V40 hatchback came on stream. 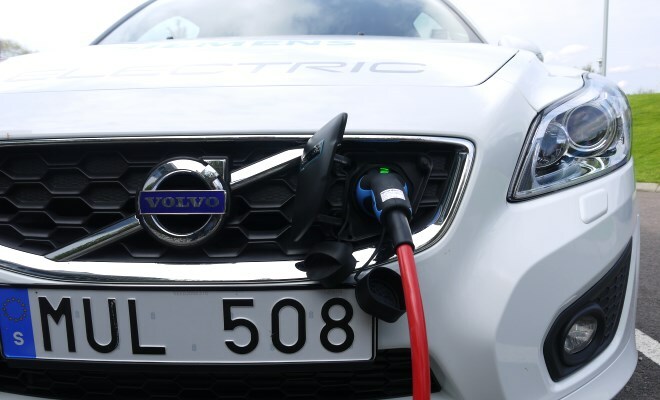 Just 100 of these version-2 C30 EVs are being hand-assembled in Volvo’s special vehicle workshops, joining the initial batch of 250 in the company’s test fleet. All will be leased to selected customers for up to five years, before returning to the mothership to be probed, presumably. So you won’t ever be able to buy a C30 Electric, though you may at some point be able to buy an electric V40 or S60 or some other battery powered model yet to be revealed. Volvo’s EV project managers are frank in admitting they simply don’t have the scale or marketing muscle to be a pioneer with more than one electric car. The arrival of the V60 Plug-in Hybrid in showrooms is a minor miracle for a company that sells fewer than half a million cars a year, all told. BMW, by contrast, sold more than four times as many cars in 2012, while Nissan sold ten times as many. Volvo will leave it to others to prove if there’s real demand for pure EVs. It simply wants to be geared up and ready if those bigger outfits start enjoying electric-car success. The small scale nature of the C30 EV doesn’t show behind the wheel. Much of what you touch is production-car C30, of course, but the powertrain seems equally well adjusted. Power delivery is smooth, linear, predictable and strong, as are the brakes despite combining discs with electrical regeneration. Only a faint grumble, like a dreaming dog, rises from the front axle while turning on full lock to betray the car’s underpinnings for what they are: low-volume, hand built and experimental. Siemens has given the car a heart-and-lung transplant since my last visit. It has provided a new drive motor and power inverter – the black box that takes DC power from the battery and transmogrifies it into the variable frequency AC electricity needed by the motor. Power is up from 83kW (110bhp) to 89kW (120bhp), while peak torque has risen by 15% to 250Nm. The car’s 0-62mph time has fallen to 10.7 seconds as a result. Progress remains ghostly quiet, with only wind noise really troubling the cabin at speed, made more noticeable by the lack of engine drone. 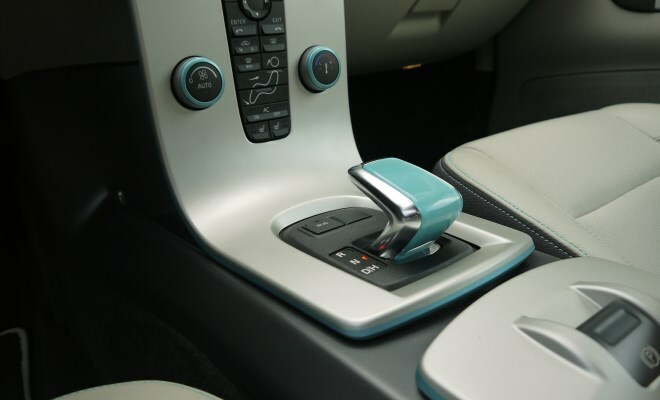 You can use the transmission lever to toggle between a standard driving mode, which includes fairly stiff regenerative braking with feet off both pedals, and a highway mode in which the car will glide serenely along on its own momentum until you press the brake. The 24kWh lithium-ion battery is unchanged from the version 1 car. Supplied by US company EnerDel, the liquid-cooled unit comes in two parts, one running down the centre of the car in a raised tunnel, the other sitting widthways under the rear bench. 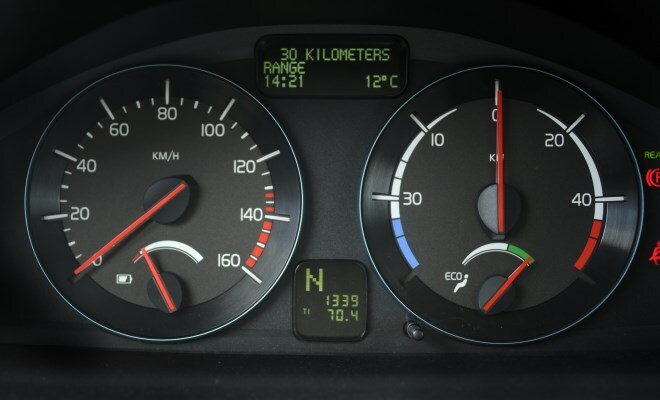 Maximum range is also unchanged at 163km (101 miles) under the optimistic NEDC test regime, or a real-world 120km to 150km (75 to 93 miles) according to local temperatures and whether the driver is wearing silk socks or lead boots. It’s all change when it comes to refilling the battery, by contrast, with a new high-power on-board charging unit capable of swallowing 22kW of 400-volt, three-phase power. That’s sufficient to cut a full recharge from eight or more hours hooked up to a domestic socket down to 3.5 hours at a fast charger. 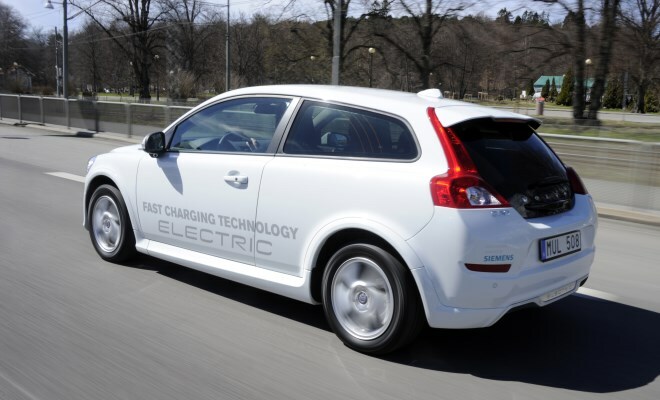 An hour and a half is enough to take a partially discharged battery from 30% to 90% capacity, while even a brief 10 minutes of juice will add about 20km (12.5 miles) of range, according to Volvo. This capability is not unique – Renault’s Zoe electric car can cope with up to 43kW – but Volvo says its charger differs by providing complete galvanic isolation between drive and charging circuits, which is an engineer’s way of saying that there are extra safeguards for the high-current charging process. Nobody at Volvo says Renault’s design is unsafe, just that their own approach is the more cautious. In use, the quick charging process feels as innocuous as plugging in a kettle, and just under two hours at 22kW takes our battery from 25% back up to full again. As lunch stops go, two hours is still on the long side, but the exercise does demonstrate that EVs are making progress. It’s a shame that Volvo is forced to take a wait and see approach to pure electric cars, having developed a low-volume vehicle that seems to promise such a persuasive package. But the numbers don’t yet add up, with lithium-ion batteries remaining stubbornly expensive, according to the company’s managers and engineers. As and when Volvo brings a production electric car to market, I have no doubt it will be good. But I suspect we’ll be in for a long wait.